Until now, each level has only existed on its own, completely unlinked from any of the other levels I’ve currently created. This is mainly because the pink square that I’ve been using as my warp between rooms can only be used if the destination is in the same coordinates as the square on both sides. 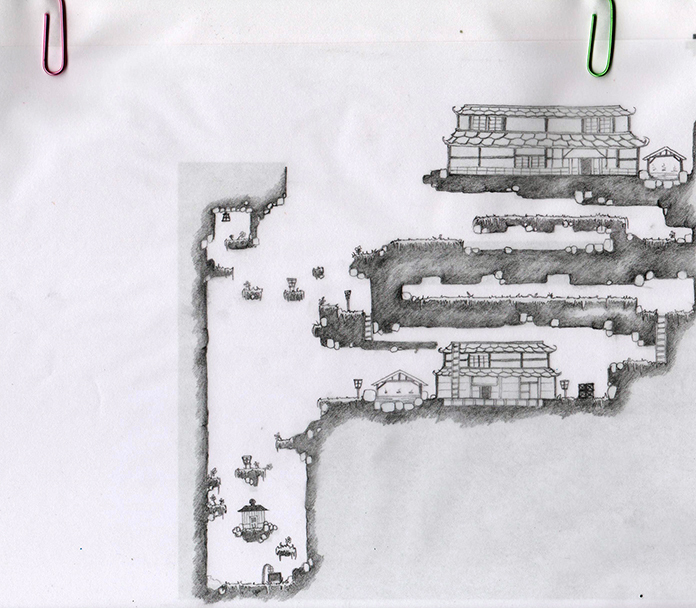 This is useful for entering and leaving buildings and caves, which I’ve made to line up with the main level structure -all buildings and caves are the same dimensions inside and out. However, in the transition between level one and two for example, the player jumps from an X coordinate of 2992 to an X coordinate of 688, so I’ve had to create a new item specially designed for transition between levels. 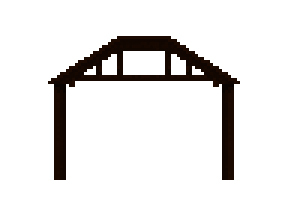 The new icon uses all my artistic abilities and has formed this go faster arrow shape to differentiate itself from the standard warp square. 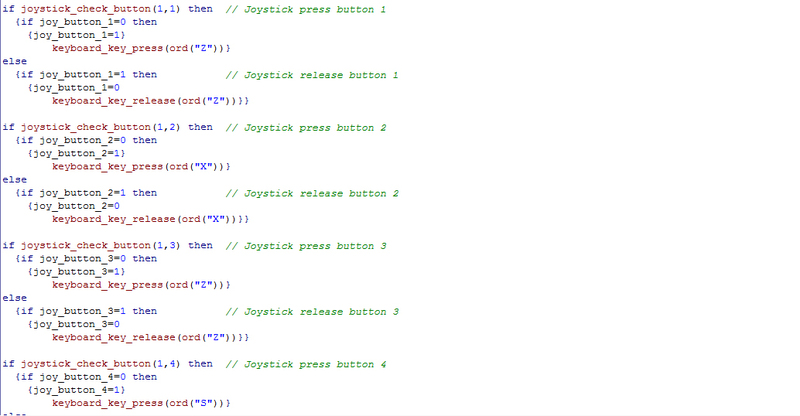 The first list controls collected sushi boxes. This was previously the same list used to hold information about collected blossoms, but as I’ve had to change everywhere in my code that uses one of the new lists it was simpler to leave this list there. The other three lists correlate to the three levels. I’ve also had to set up three different “gamescore” variables, which display the amount of flowers collected in the HUD and in the inventory. Because these are persistent global variables, each value will remain even if the figure doesn’t show. So when the player leaves and returns to level one for example, the figure will return to the previous global.gamescore1 figure. 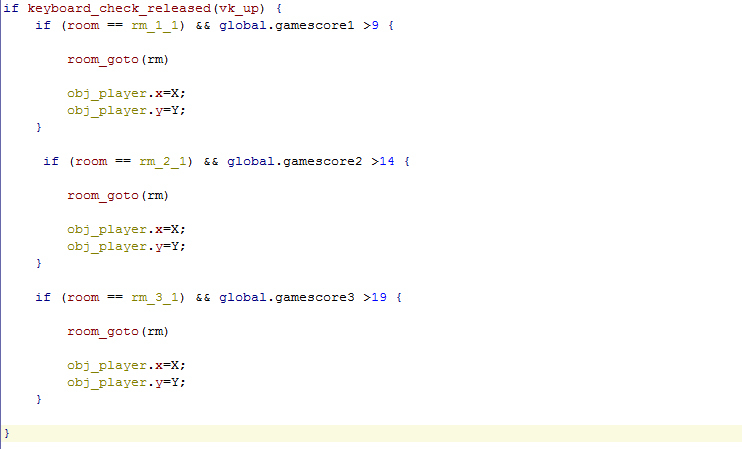 In order to determine whether a level transition will work depending on score, I’ve simply stated that gamescore1 must be over 9, gamescore2 must be over 14 and gamescore3 must be over 19. 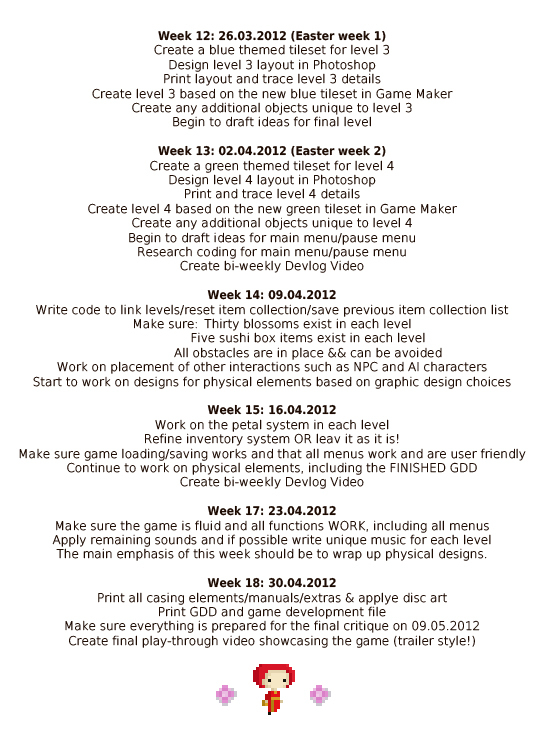 If not, the player won’t be able to progress to the next stage. All programming/development has literally been on hold this week while I fill in graphics, so it feels like I don’t have much to say recently. Level 3 is now looking pretty finished, so I’ll include some video footage in my next Devlog Video of me running around it! 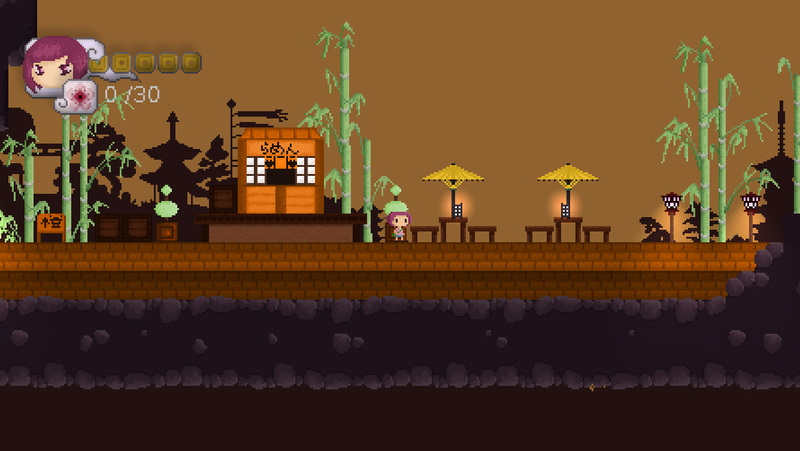 I didn’t have to make too much more for my latest blue level, except for a new water tile for the onsen (which may be temporary for now), and a new structure to mark where the onsen are. 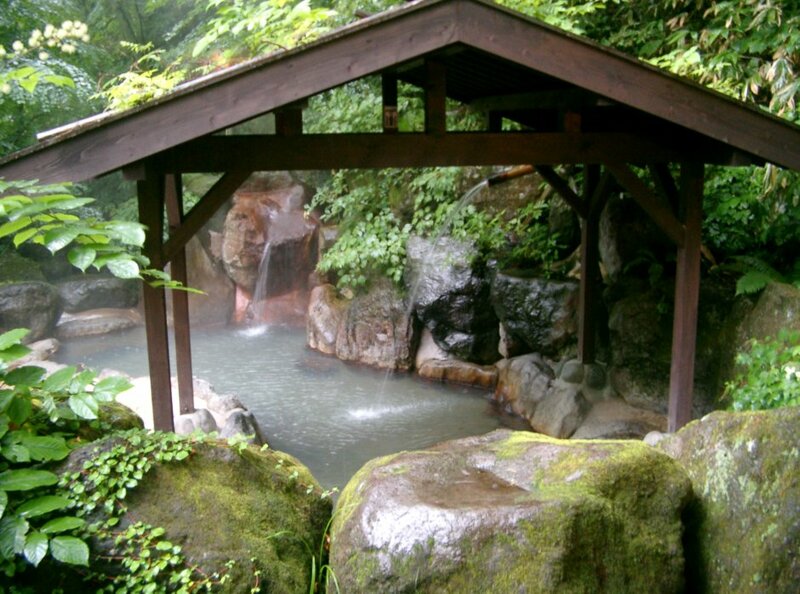 The tile in the middle of the structure can be repeated to increase the width of the structure, as most of the onsen are different shapes and sizes. I originally wanted the middle to be peaked, but this raised serious difficulties when trying to extend the structure width-ways! I’ve placed the new tiles into the level, including the finished second hald of the level, which was looking very bare before. 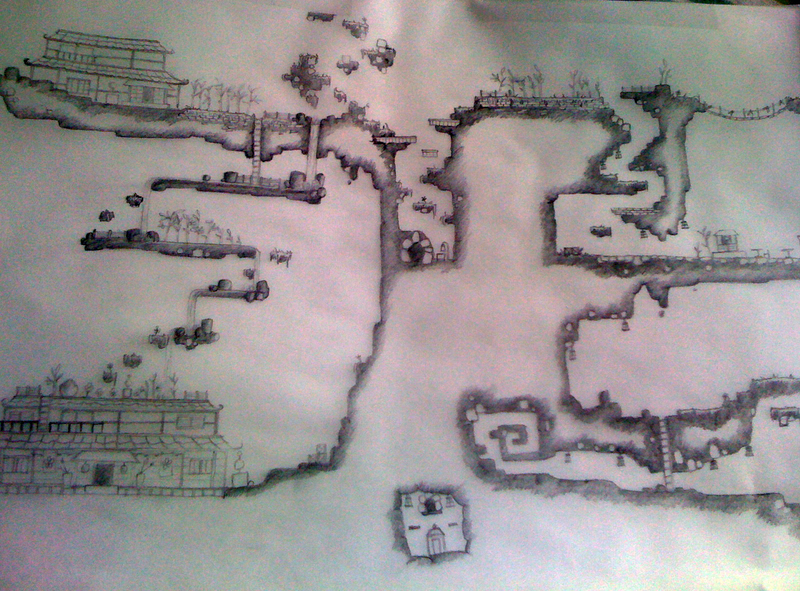 The last part of the level to design was the level’s only cave, which stands alone with four entrance ways as opposed to having two cave sections with fewer entrances. 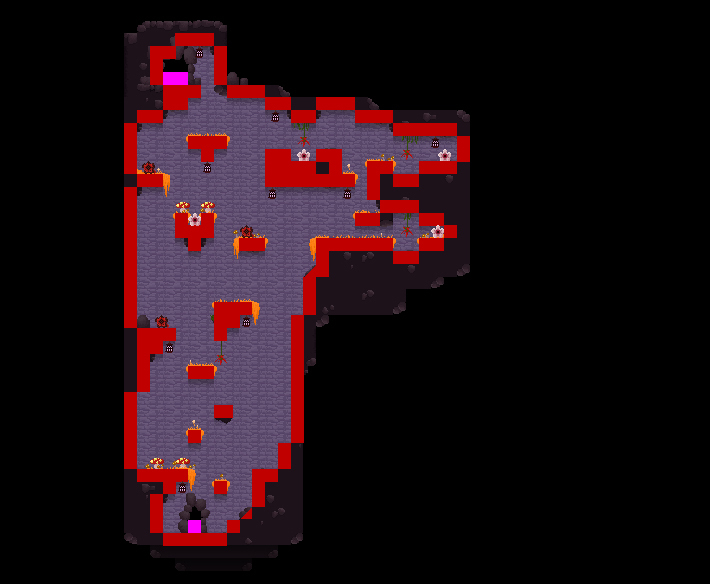 You can see how each of these entrances align in the centre of the map in the image below, obviously in the room editor the pink squares represent warp points between rooms. 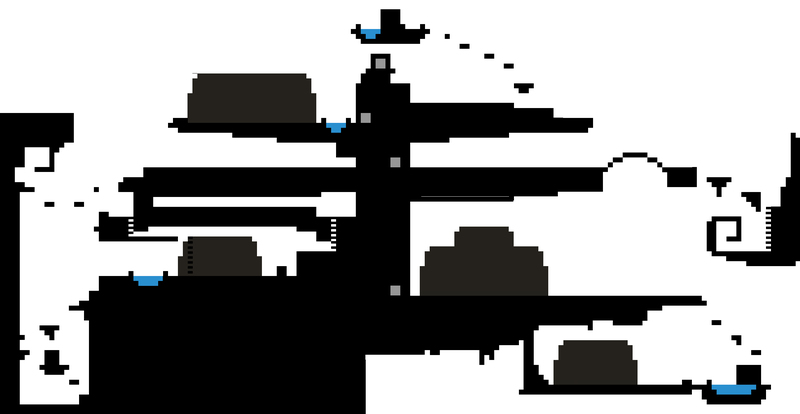 The player can only wait until a timed move past the plant, because a left or right movement would result in the player falling. So, with this in mind I designed (most of!) the cave to revolve around climbing as many ladders as possible. I feel so blue now! 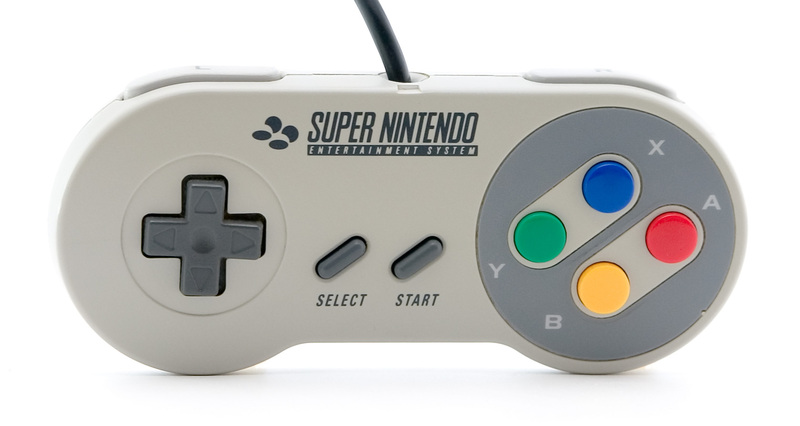 If the difficulty is poorly tuned, the game can become either impossible or boring. 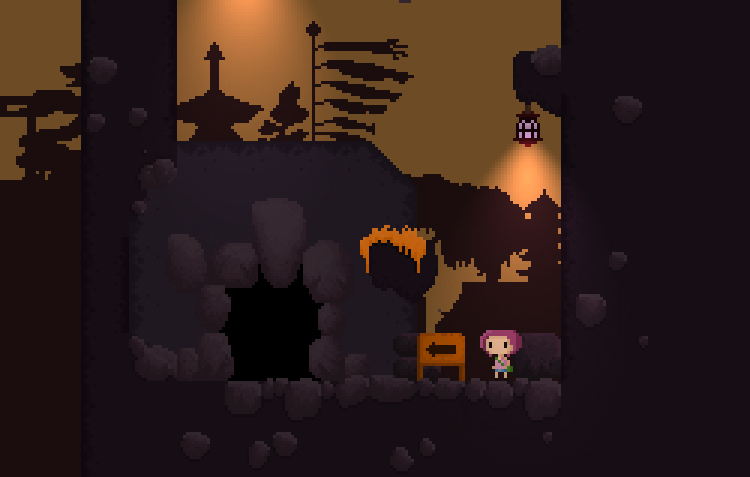 Today I’ve been designing and building the cave sections of level two, which I’m planning on having two of in each stage. 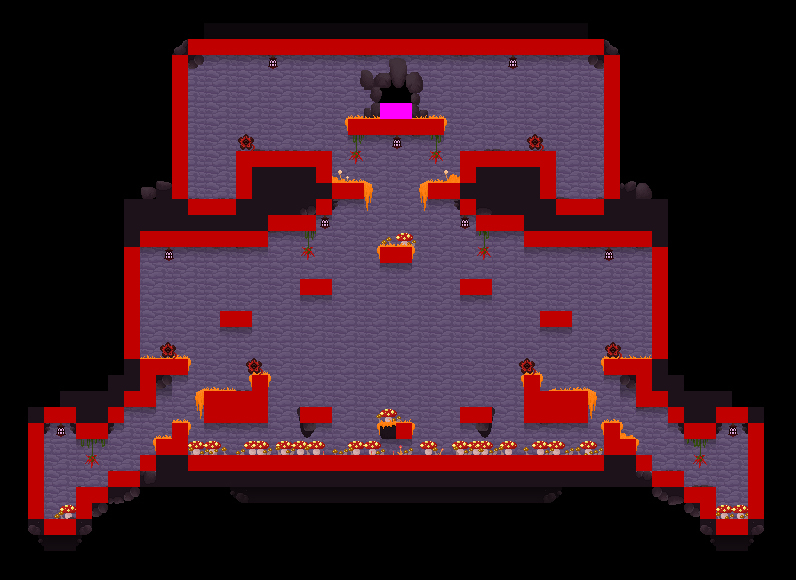 In level one, the caves were the level’s “mini dungeons” and contained many more strategically placed obstacles than the rest of the level, which in turn made the caves more difficult than other areas. 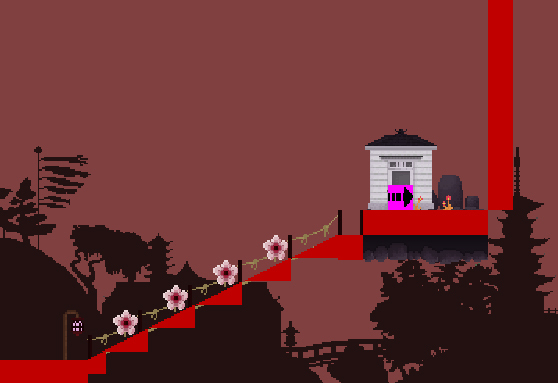 I made sure that the level could be finished without actually having to enter a cave, although if a player wishes to collect all thirty blossoms in the level then they would have to! 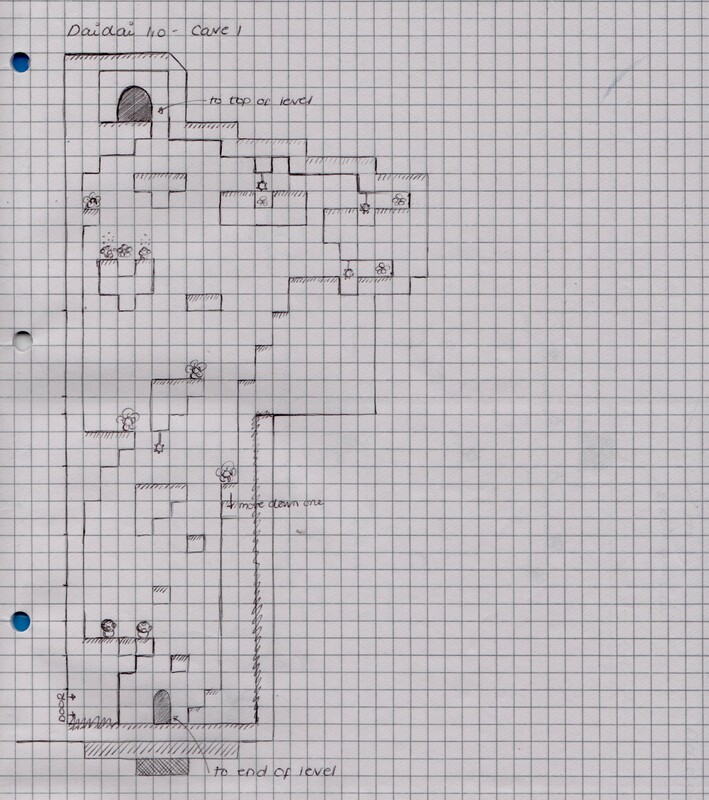 In level two I’ve made sure that the caves must be entered, by placing the end of the level at the exit of one of the caves. 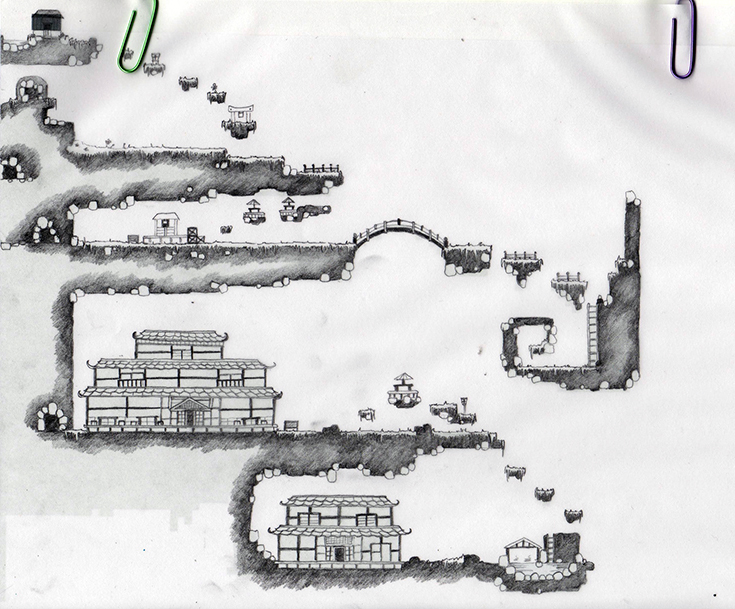 The aim of the design is to be more difficult than the rest of level two, but also more difficult than the caves in level one. This creates a difficulty “curve” which the player must adapt to, although more game developers seem to agree that there is no actual curve in game difficulty most of the time! In the blog I’ve pulled the quote from above, one example of a difficulty curve is described like a staircase, rising at intervals but lying flat for a while afterwards. Mine consists more of peaks and troughs, as difficulty is increased by a higher level of obstacles in cave areas but is lowered again when outside. 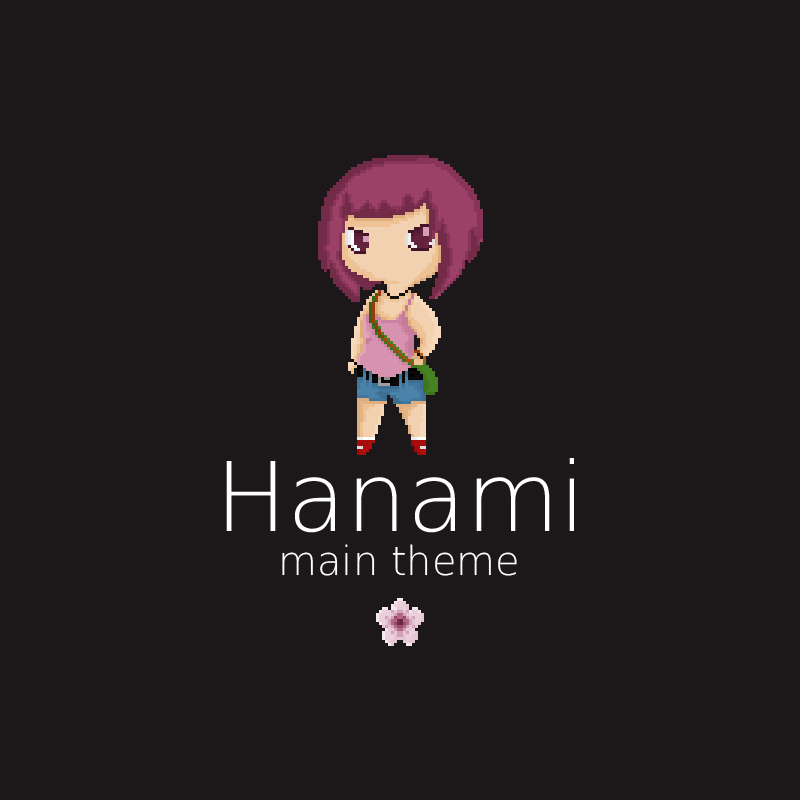 Because Hanami is likely to only have three main playable levels (and a fourth ender level), I’ve aimed to increase the difficulty fairly rapidly, so that the maximum level of difficulty is reached by the end of the game. 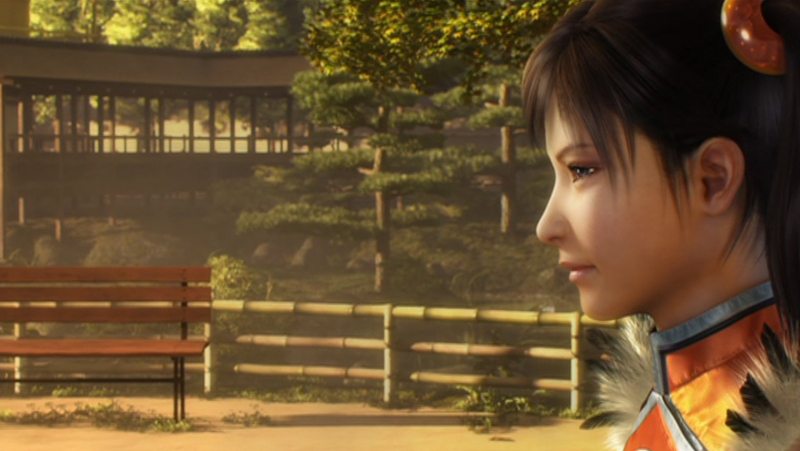 Throughout this cave the player must be constantly more aware of their surroundings and the timing of their moves. I’ve tried to keep a similar level of difficulty in the second cave of the level, which is an optional cave which doesn’t lead to anywhere else in the level. It is accessed by hopping across a few platforms before reaching the Koinobori Cafe in the levels south-east corner. 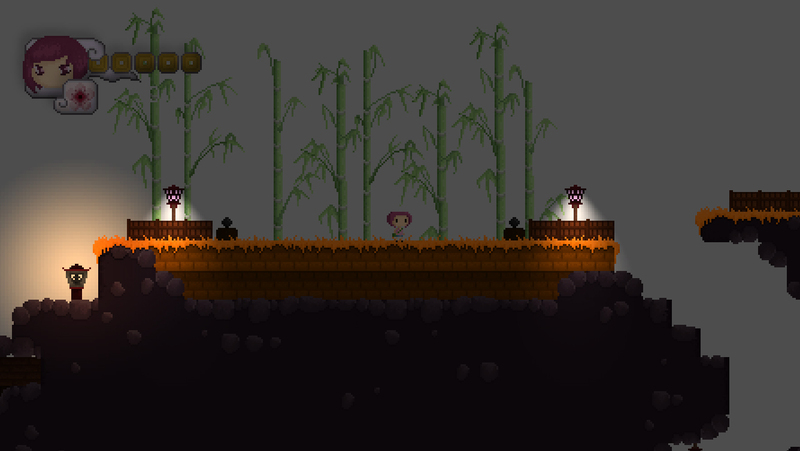 As you can see, this part of the level still needs a fair amount of work doing to it! 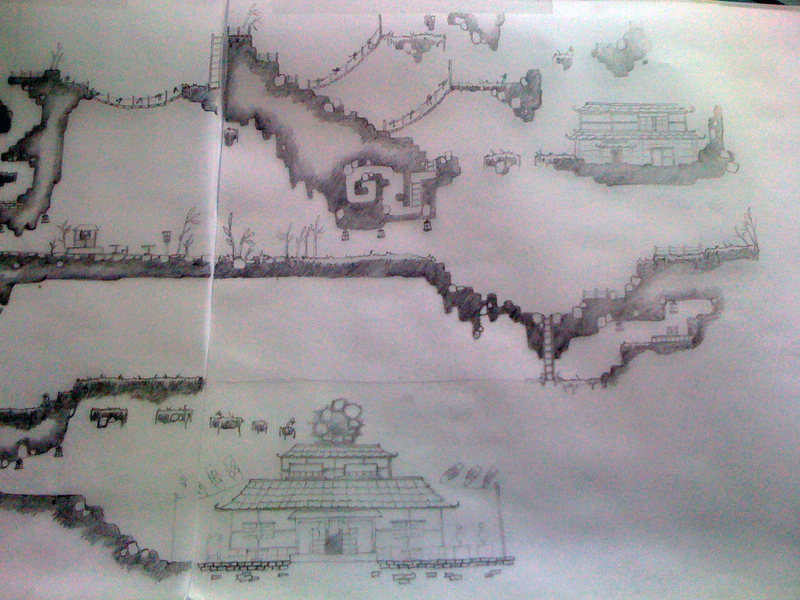 I enjoyed designing this cave as it occupies a wider space than my previous caves which tend to travel vertically. 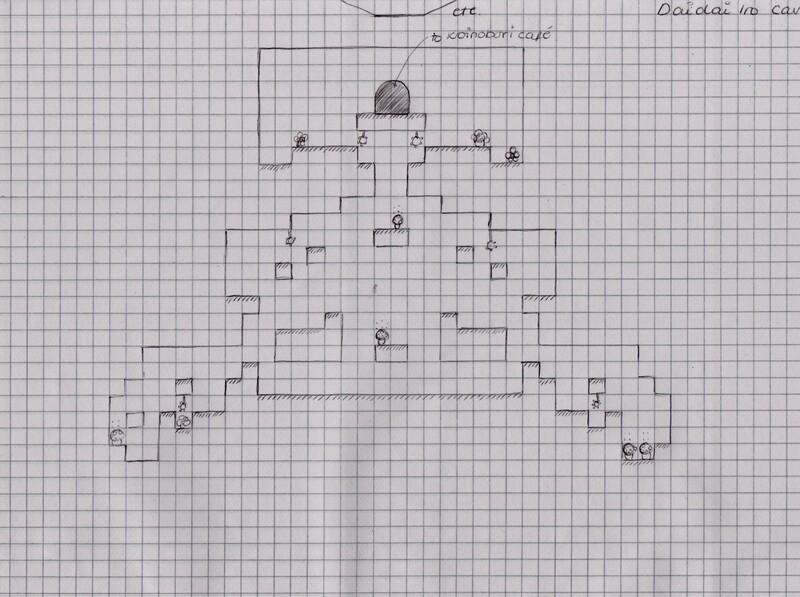 Part of the challenge of this design is that the layout is almost symmetrical, apart from a few blockages caused by mushroom enemies which halt the play from progressing on one side or the other (unless they choose to take damage). 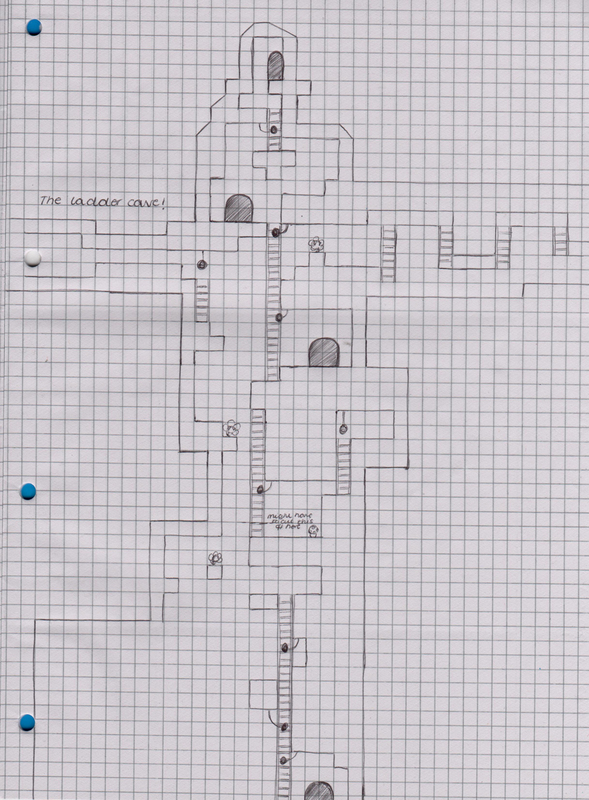 I’ve included some of the same sorts of challenges throughout this design, although I’ve increased the difficulty of this part slightly by creating a cave-bed that cannot be touched if the player falls/misjudges a jump etc. 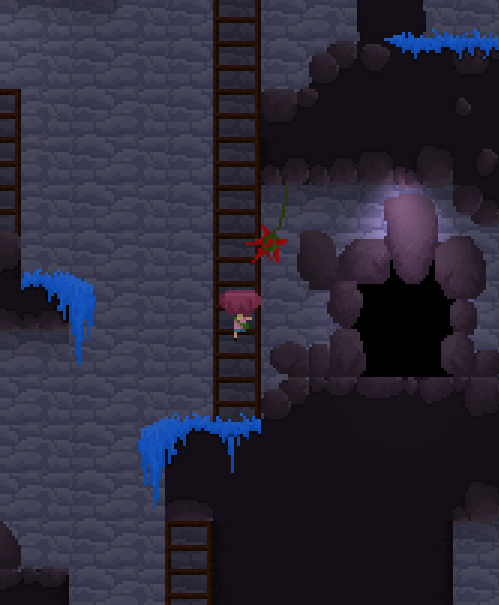 I considered creating a lake of poisonous liquid or some other such over-used game cliche, but for now at least I’ve ended up using my Hello Mushroom enemy to fill the bottom of the cave (as a result I’ve nicknamed this the mushroom cave. I think it’s pretty.) 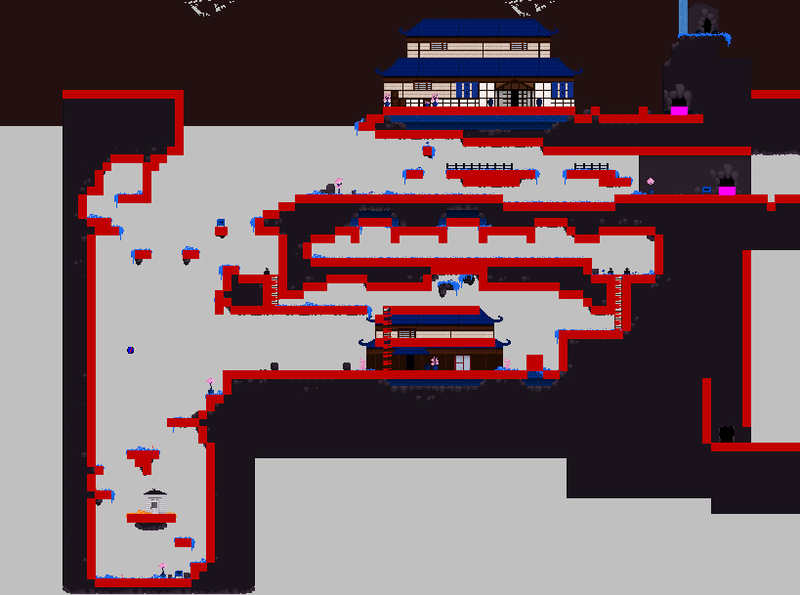 I haven’t placed any blossoms in this cave yet, but I’ve planned for one to go at the bottom of the cave on the left hand side. 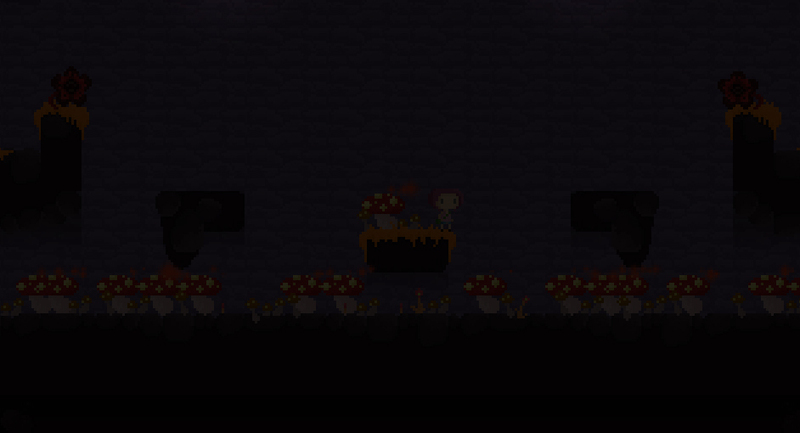 On the other side, the player is simply met with yet more mushrooms! That's a lot of mushrooms. This is definitely the hardest part of the game so far, possibly even the hardest I will make. 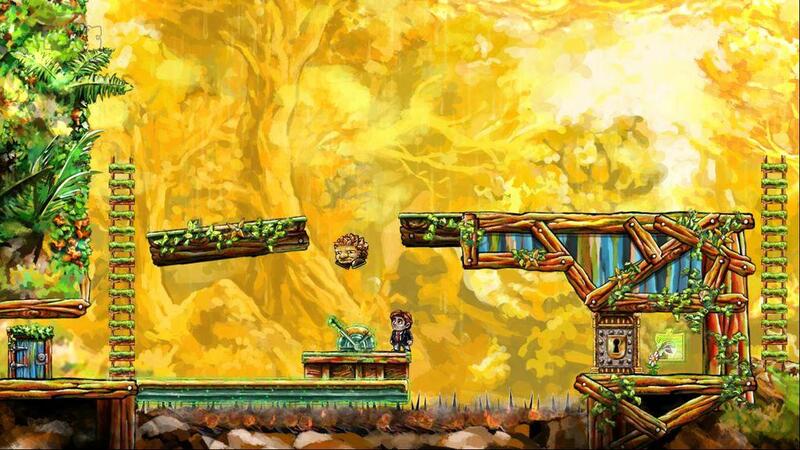 The difficulty is due to a mix of difficult jumps, awkwardly placed obstacles and the inability to fall safely! One thing that’s been bugging me for a while is the overpoweringly plain background, which so far has been a challenge to improve. Because Game Maker doesn’t support large images, the background must be repeated in some way and can’t consist of one specially designed image. So far I’ve created one repeating image that repeats itself across the X axis at the top of the screen, but the image cannot be repeated vertically, so for the majority of the space I’ve ended up with a solid block colour filling most of the screen. 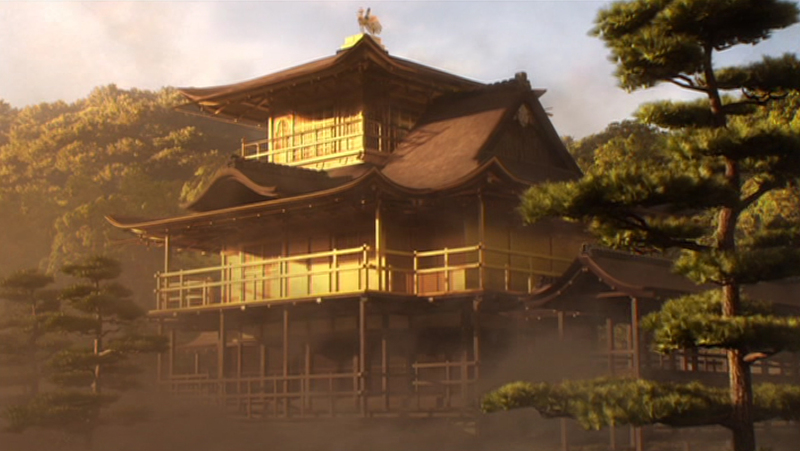 I’ve tried taking inspiration from existing games, although a lot of the most successful backgrounds (in my opinion) are either made of large complex images specially created to fit the foreground, or they’re smaller images that can have a “proper edge” because there is no moving camera change the background view. 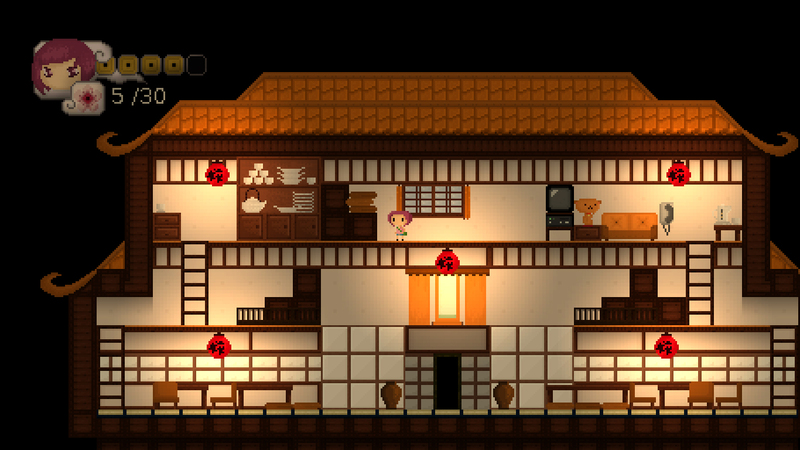 Above is an example from Braid, which consists of a huge background which pans the extent of the room. 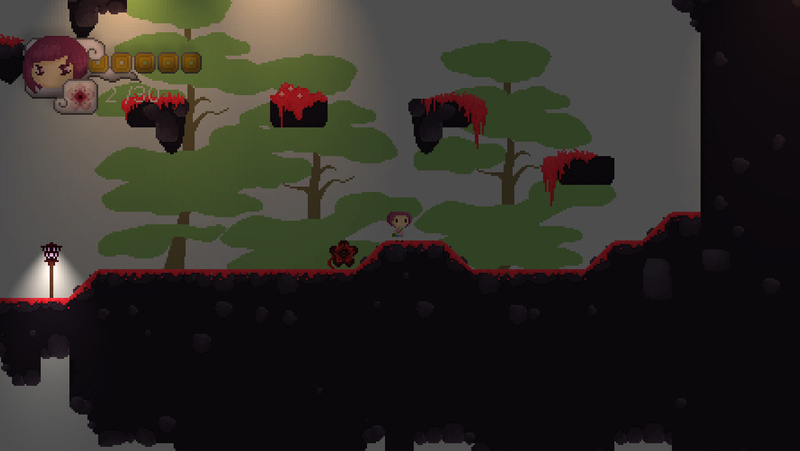 A Boy and his Blob has some really great foresty parallax scrolling backgrounds, and to some extent some vertical camera movement. 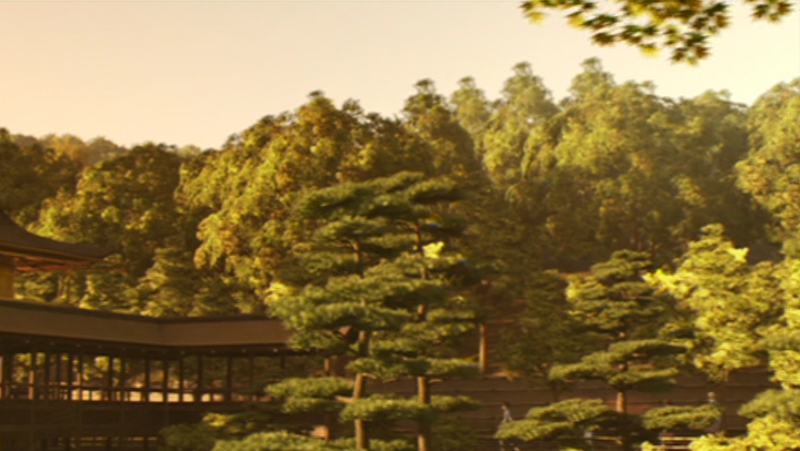 Here the trees have been scaled to create a sense of depth throughout the background, and brighter colours have been used closer towards the foreground to reduce the emphasis of distant background features. This is something that I could really consider incorporating. A while ago I posted about some trees that I designed to be part of background imagery, but I have since removed these because I felt the design was too inconsistent with the foreground. I felt inspired to redesign these recently after watching Tekken: Blood Vengeance (of all things :S) and seeing a similar style tree in the Japanese landscapes of the film. The colours have also been dimmed slightly, because I noticed that the old design cluttered the foreground a lot more than it should have done. 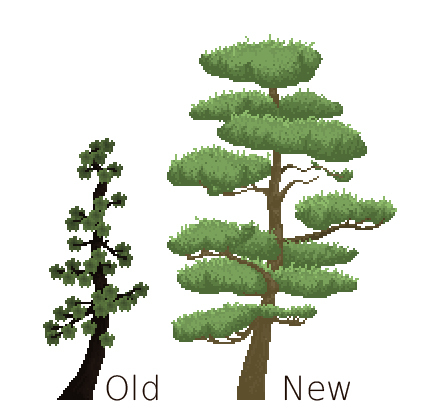 I only have one tree made up with this new design, but it doesn’t seem to get too repetitive when placed throughout the game. 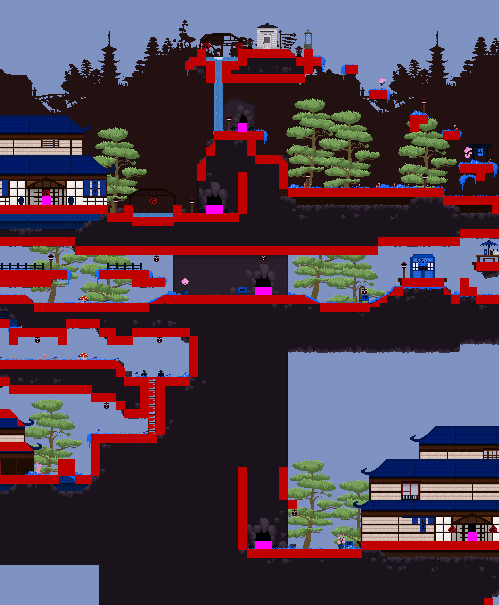 I’ve placed the design into level one for now, although I’m considering only using Cherry trees in this level and saving the Bonsai style trees for level three. I haven’t got round to adding any “depth” to the background imagery yet, but you can see here that I’ve been playing around with difference colour combinations etc. 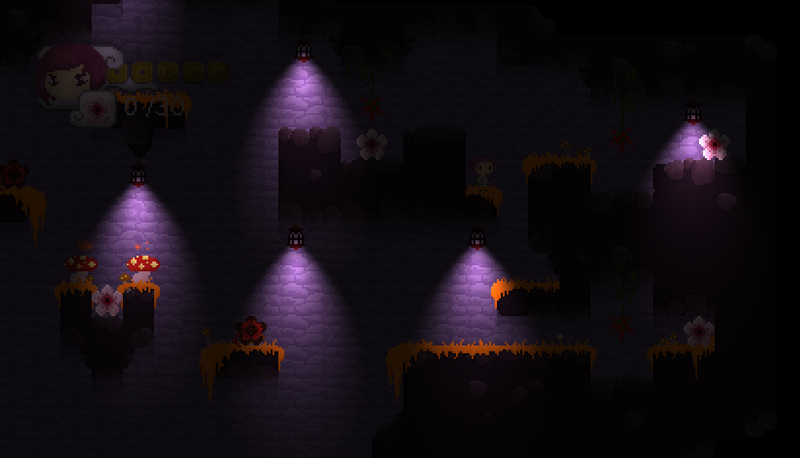 I’ve finally got round to brightening the ambient colour overlay which activates the lights, so the level feels a lot less dark now! The new colour is “grey38” from this list of hex code colours. 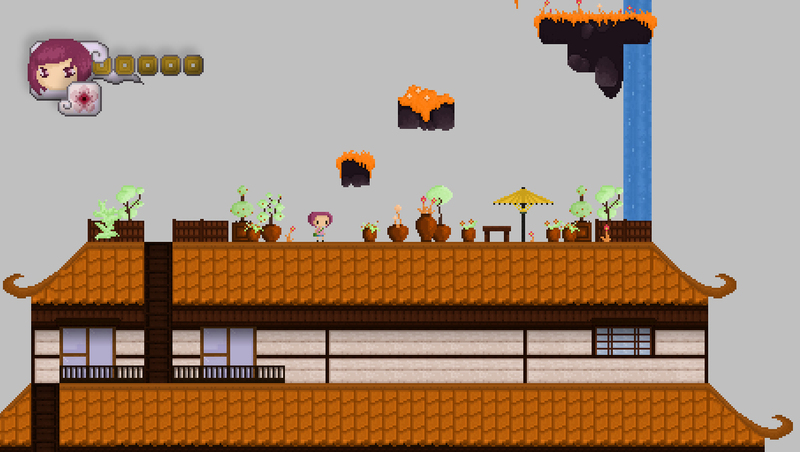 The colour of the sky here may or may not stay, but this is intended to be level specific, so in level two the sky will be an orangey colour. 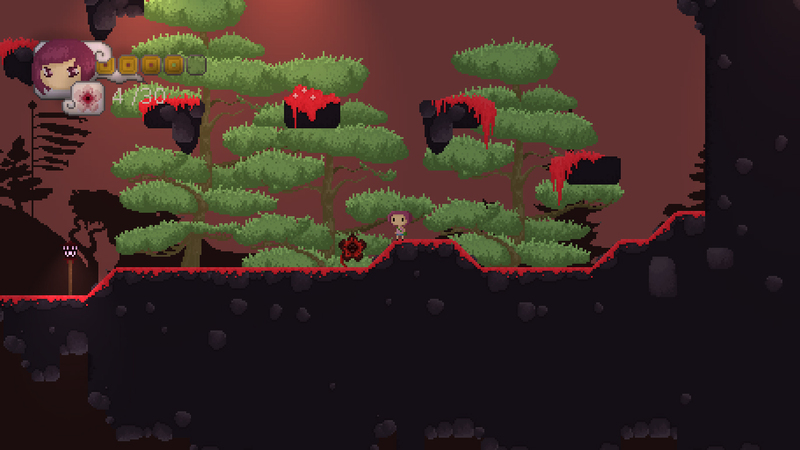 I’ve also been working on an alternative to trees in level two to add a little more variation to the level. 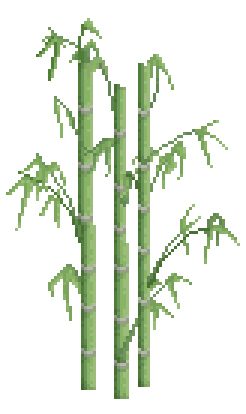 Instead of a thick layer of trees, I’ve been trying out a thin layer of bamboo in a similar colour scheme to the new tree designs. 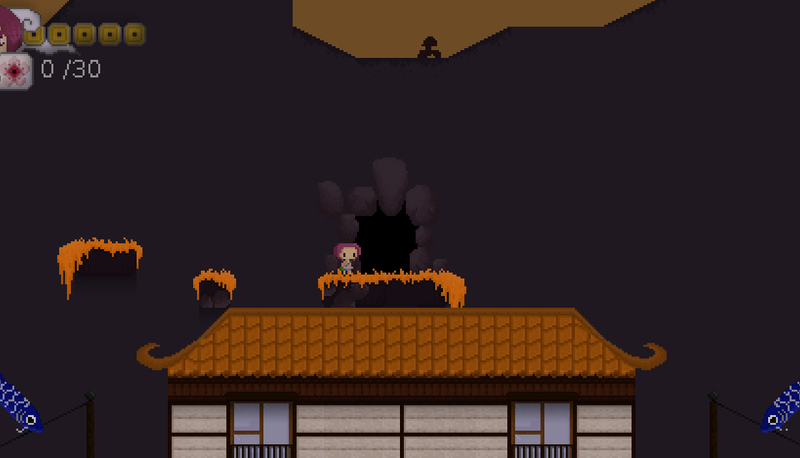 In this last image, you can see that I’ve added the same silhouette background, ambient overlay and sky colour to create a much more finished looking background, which is consistent with other levels. Where has my Sharpie gone? 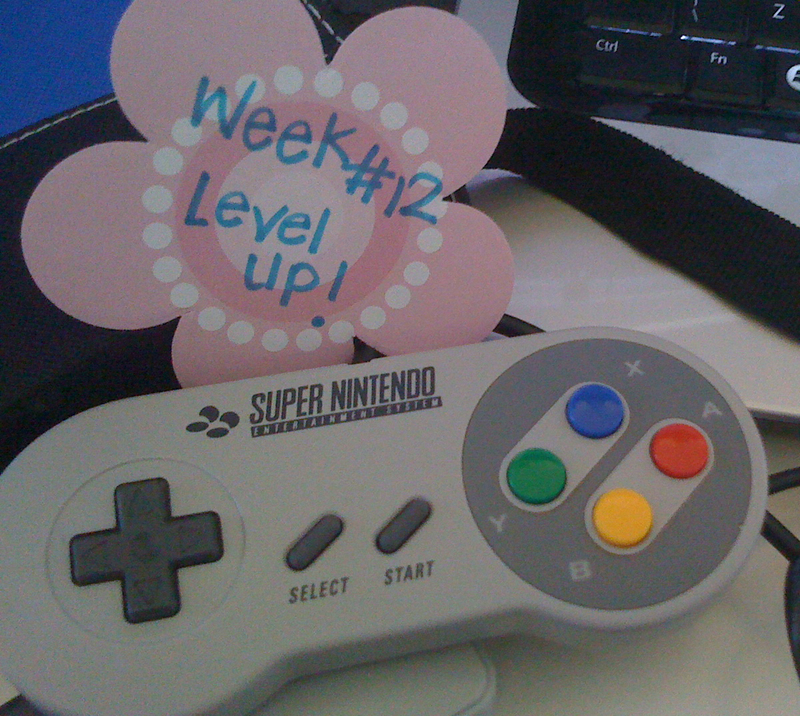 It’s taken me eleven weeks (honestly, longer than expected…) and I’ve finally misplaced my Sharpie :(. The closest thing I could find was my beginner’s fude pen, so I’ve written this week’s target in Kanji with Hiragana subtitles! Its amateurism is probably offensive to the Japanese, so for that I apologise. I’m working on it! 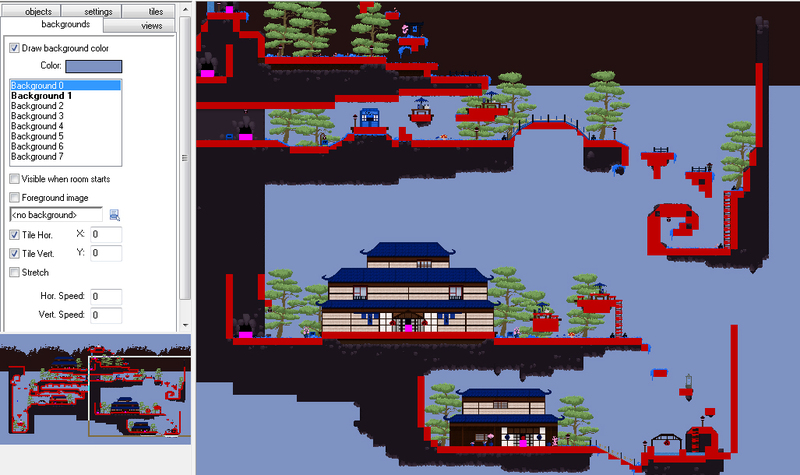 I’ve already started to create Hanami level 2, and actually the main structure is very much in place and I’m filling out the details. 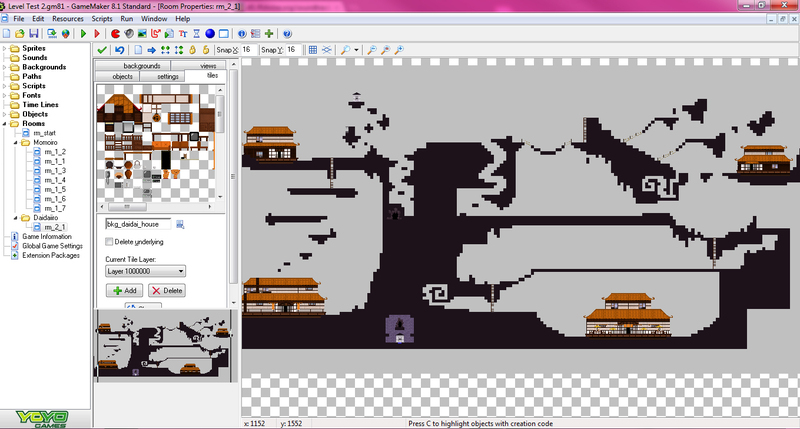 I started off by making the platforms all one block colour, which I did in the previous level several times! 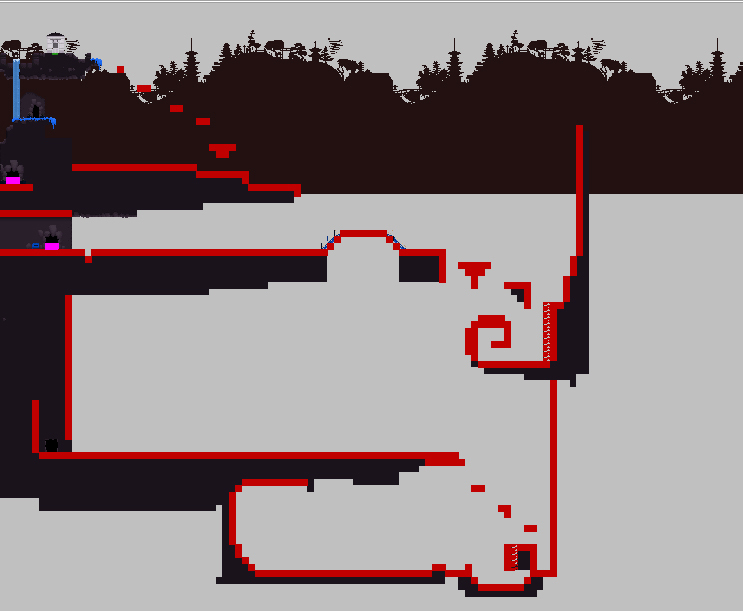 This time took considerably less because I wasn’t making tiles as I went a long and I knew the sorts of detail I would be adding. For the outdoor detail, I’ve also changed things like grass and plant colour to orange, as well as all man-made structures. 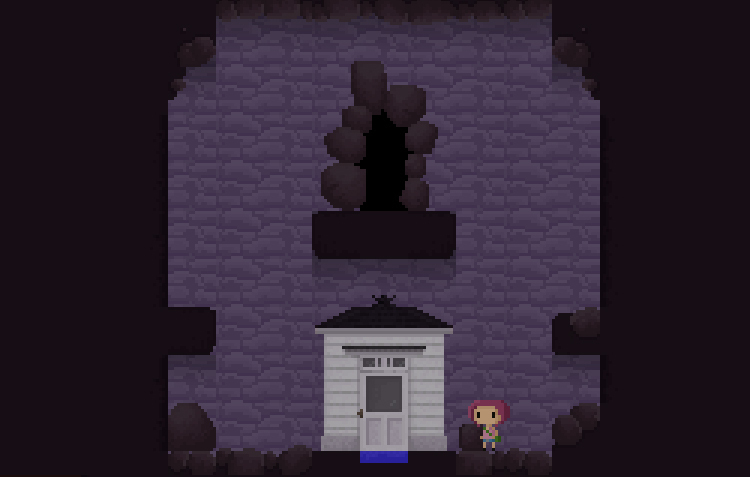 I’ve only used my previous tileset around the door to the previous level, to show which level the door goes to! 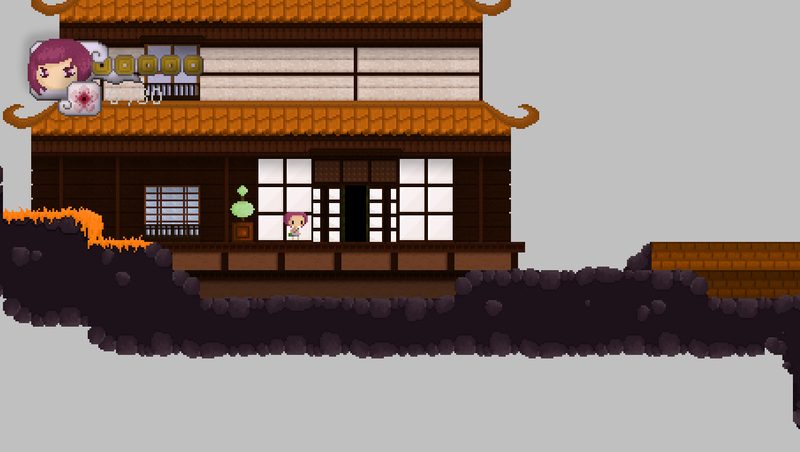 I’ve also added some orange flowers around the door to this level. 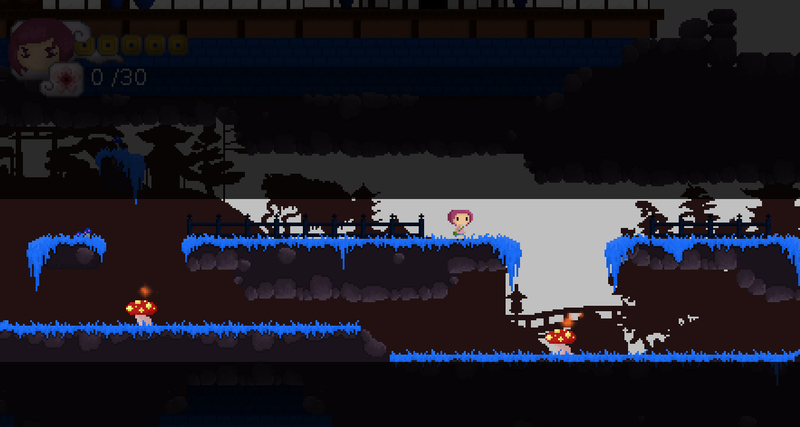 I’ve made a few additions to the tileset to give this level some unique features, but they have been minimal. My old set seems really flexible, especially when it comes to creating new platform shapes. 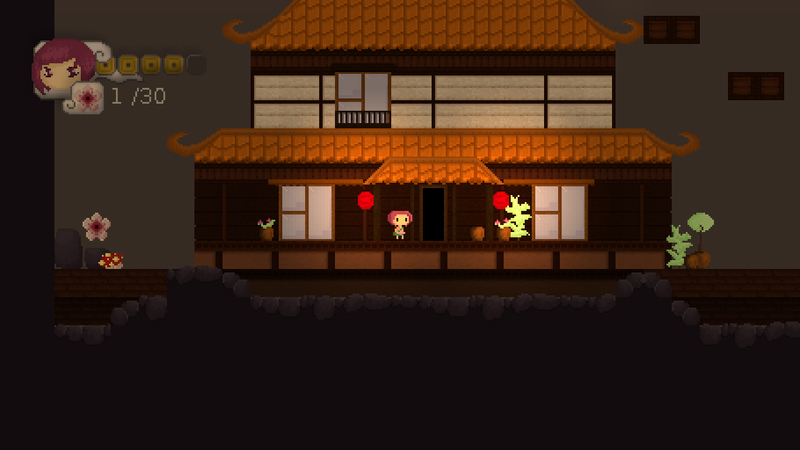 In the screenshot below, you can see a couple of new features like the bamboo fence and square plant pots. This building is supposed to be a roof garden belonging to an ikebana specialist, hence all the plants! 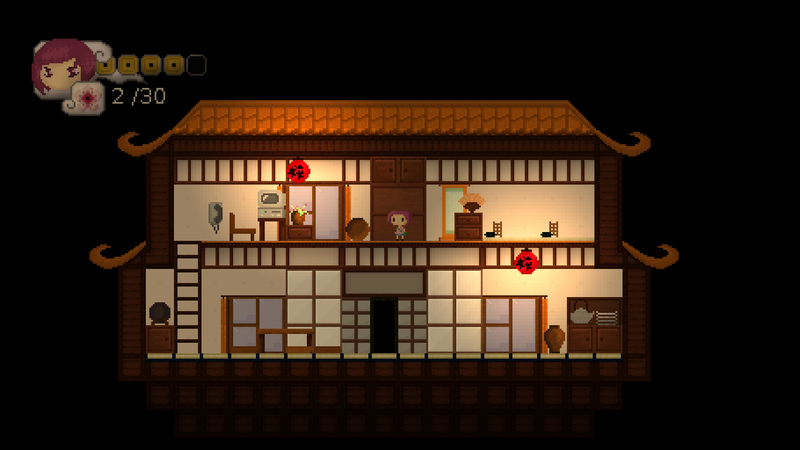 I makes the similarly styled buildings more interesting. Palette Swapping is a cheeky little technique used by game developers in order to recycle assets. 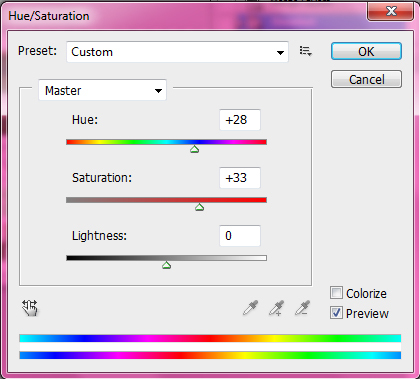 It involves taking an asset previously made and changing its colour scheme, sometimes (but not often) giving that asset a completely different look. 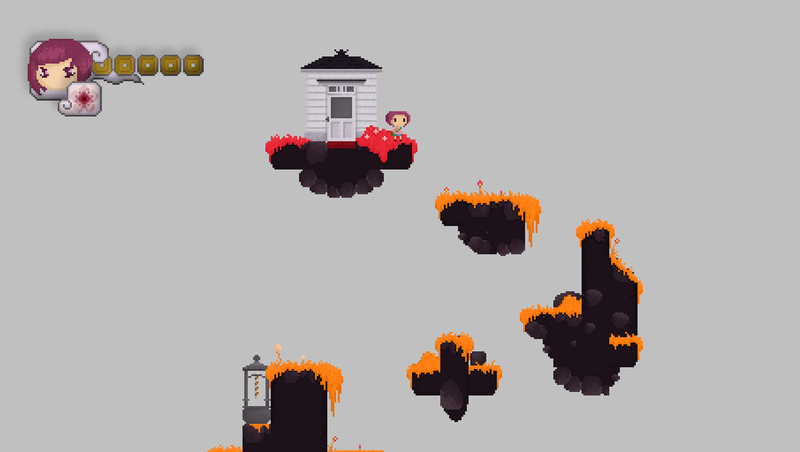 Using a little Photoshop magic, I’ve quickly and easily turned my pink/red tileset into an orange/yellow one! 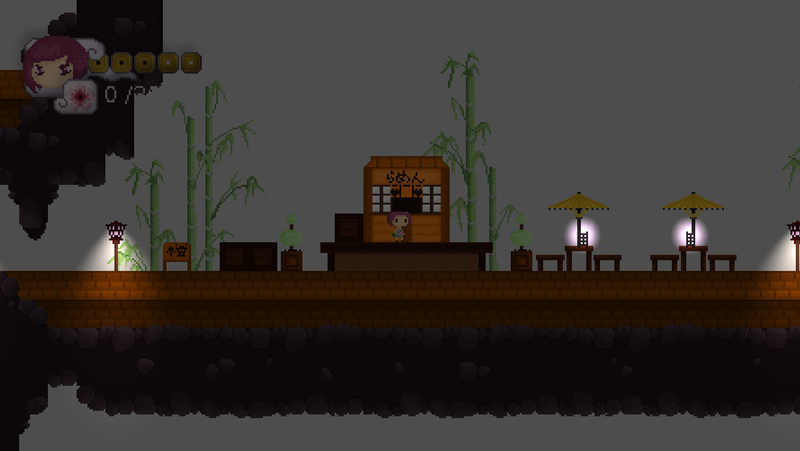 The level design for “Daidai Iro” is now complete, so I’ll be constructing this in Game Maker over the next week, whilst working on some of the things that still need a little sorting out from before, including the implementation of NPC characters and with that the new petal system which I still need to make!